"When the Day Breaks is the charming, bittersweet story of Ruby, the pig, whose life takes an unexpected turn after she witnesses the accidental death of a stranger. With deft humour and finely rendered detail, the film illuminates the links which connect our urban lives, while evoking the promise and fragility of a new day. The film, described as a four-year labour of love by the filmmakers, is exquisitely crafted, using pencil and paint on photocopies which gives it a textured look reminiscent of a lithograph or a flickering newsreel. In When the Day Breaks, the ordinary -- a lemon, a toaster, a chance collision on a street corner -- is endowed with a visceral power." Nominated for an Academy Award in the Short Film (Animated) category. "The Internet Movie Database: When the Day Breaks." Internet Movie Database, Inc. http://www.imdb.com/title/tt0200282/combined. National Film Board of Canada. "NFB -- When the Day Breaks." National Film Board of Canada. 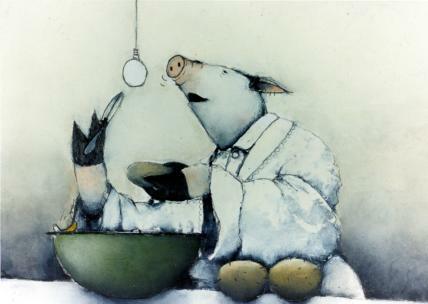 http://www3.nfb.ca/collection/films/fiche/index.php?id=33251.